Who's the chick with Harry? In Chicago, we're very proud of the Obamas. They're like our royal family. Until, of course, an actual royal shows up. This week, Prince Harry was in town! He was here for a summit, one of the first events sponsored by the Obama Presidential Center. 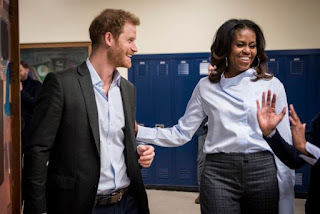 He and the former FLOTUS took a side trip to Hyde Park Academy, a high school in the South Side neighborhood where Michelle grew up. Mrs. Obama and Mr. Windsor encouraged the students to "stay inspired and hopeful," and to use their voices to change the world. 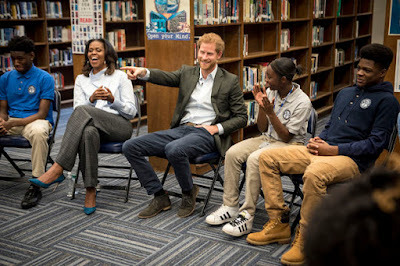 To say Harry was a hit with the kids would be an understatement. His mother would be proud of his ability to relate and inspire everyone he meets.